Transgender rights represent a relatively new frontier in civil liberties activism. They have historically been disregarded and marginalised by the soceity. The discriminations against transgender reveal our petty-bourgeois mentality that is mostly reluctant to recognise gender deviance. Despite years of discrimination, the transgender community has survived the taunts, humiliation, and savagery, and continues to fight back. In Pakistan the Islamist jurist Dr Mohammad Aslam Khaki joined their struggle and filed the petition for the welfare of the unfortunate and vulnerable community abandoned by society. 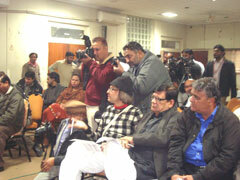 Dr Khaki's activism led to the Supreme Court ruling in favour of the protection of transgender rights. The chief Justice Iftikhar Muhammad Chudhar, Supreme Court of Pakistan has ruled that transgender people are "full and equal citizens" of Pakistan and should be accorded all the rights and benefits of federal and provincial governments. The 9th November 2010 was an other historic day for the history of transgender rights in Pakistan, because a Punjab Ittehad Bara-e-Haqooq-e-Khawaja Sira was formed. The fallowing members were nominated by the participants; 1) Norooz Abbas, Kasur, coordinator, 2) Layla, co- coordinator, Nazir (Gog), Lahore, Dedar, Multan, Naseem, Okara, Pakiza, Kasur, Noshi, Lahore and Nelee from Lahore. 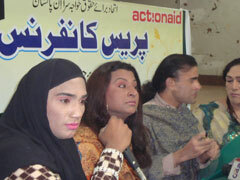 The 12th November 2010 was also another historic day for the history of transgender rights in Pakistan, because a Sindh Ittehad Bara-e-Haqooq-e-Khawaja Sira was formed. The fallowing members were nominated by the participants; Bindia Rana, Karachi, coordinator, Sanum Shah, Sakkur, Riffi Khan, Karachi, Sapna Shahzad Karachi, Sana Tariq, Karachi, Ruppa, Karachi, Naseebo, Karachi, Mashi Khan, Mirpur Khas. 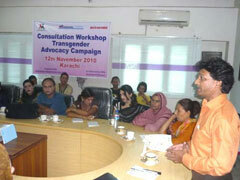 On 7th April 2011, a National Consultative Meeting was organized by AAS Pakistan at National Hotel, Lahore, in partnership with Actionaid Pakistan, in which members of Ittehad Barae Haqooq-e-Khawaja Sira, Sindh and Punjab participated. 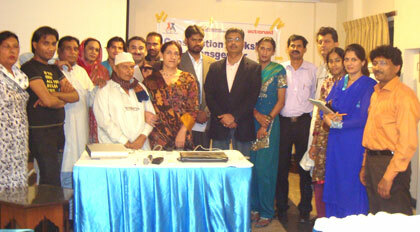 It was facilitated by Hector Nihal, Director, AAS.